MAGNIFICENT and very huge is the famous Topkapi Palace in Istanbul. Many different palace buildings are set in a big park. 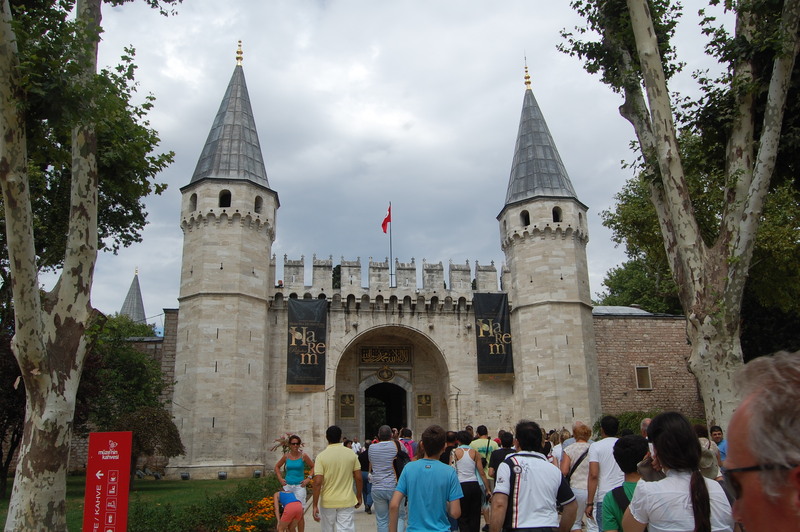 I just went to see Topkapi Palace, and the Imperial Armory was fascinating with armour, scimitar swords, flintlock pistols, matchlock rifles and even Japanese Samurai Katana (swords). The most amazing and impressive exhibit is the glittering Spoonmaker’s Diamond weighing in at 86 carats and the size of a child’s palm! This priceless diamond is the 3rd largest in the world! Lots of rare emeralds and rubies and gold jewellery on show too. As for the Imperial Harem I was flabbergasted to learn that there were 1,371 ladies there! The Ottoman Sultans lived here from the 15th to the 19th Century in unimaginable opulence and luxury. The Topkapi Palace has a circumference of 6km! Incredible but true! I also went to tour the Rusten Pasha Mosque completed in 1536 with its beautiful Iznik tile decorations on the walls. Mehmet the humourous tour guide was very entertaining with his anecdotes about the Sultans of old. He spoke with a quaint British accent which he picked up as a University student in Bristol in UK. Tonight I shall try the cuisine of the Grand Hyatt Istanbul’s new restaurant called ’34’ which is only 3 weeks old! By the way the weather here is very hot and sunny at 33 C! This entry was posted in Hotels & Resorts, Travel. Bookmark the permalink.